Is there anywhere I can park at your Trade Counter’s? A.Yes there is, we have customer parking right outside all of our Trade counters. How much will my cylinder cost to repair? A. Until the cylinder is taken apart, it’s hard to give an exact estimate but we can contact you before carrying out any repair. Can you test my cylinder to see if is leaking inside? Yes, we have a good in-house test facility for this purpose. Can you repair cylinders while on our site? This cannot be done, as it has to be taken apart in a clean environment and must be tested to the correct pressure. Can you hone cylinder tubes? Yes we can but it will depend on the level of damage to the cylinder tube. A hydraulic system is the network of valves, hoses, components and pipework which makes your machinery move. They can be incredibly diverse and as complex as imaginably possible but always work on the same principle using an in-compressible fluid. Hydraulic power generates huge forces, this power can be used to lift enormous weights, steer giant marine vessels, mobilise heavy plant and crush metal. Why do hydraulic components fail? Like anything mechanical, wear and tear is eminent. Seals, springs and components that rely on a tolerance fit lose efficiency overtime or from damage or poor filtration and leak, meaning the system doesn’t get the pressures it needs to work. We can diagnose any fault and get you back up and running again. What oil do I need to use? Only dedicated hydraulic oil can be used in hydraulic systems, see us for all your oil needs. Why are my hydraulics running hot? Excessive heat occurs when more heat is produced than can be dissipated. Inefficiencies cause heat, as well as poor filtration and lack of cooling. We can keep your system running at optimum temperatures which will prolong the life of the components. I need a hydraulic system for my new machinery but don’t know what I need? Call us today, we will come to site and work out your requirements then design a system to suit your needs. My machinery equipment has just blown a hydraulic hose, what do I do? The first thing you need to do is control the hydraulic oil spill, we suggest using an emergency spill kit there are available from anyone of our Trade Counters. The next thing you need to do is call in your emergency breakdown 0800 707 656, our controller will dispatch the closest engineer to attend. Whether your fluid power problem is on a mini digger, roller, excavator, long reach or piling rig we will keep your machinery moving. I’ve called the emergency breakdown, how long before you can get to me? Typically within the hour. Our experienced controller is able to advise you of the engineers ETA when the breakdown is called in; all of our fleet are equipped with trackers. We’re the team that gives honest ETA’s, if we say within the hour, we really do mean within the hour. Your controller told me I would have an engineer here within the hour, why has it taken him longer to arrive? Unfortunately some things are simply beyond our control; if for example an unplanned road closure or diversion takes place. Should this be the case, you will be immediately notified of our delay. 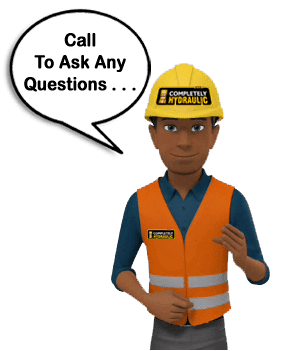 I’ve called in a Hydraulic engineer from another company, and he hasn’t been able to help – will you? Our team of engineers have a vast amount of knowledge and experience, our well-equipped mobile workshops enable first time fixes to be achieved 98% of the time. Should the fluid power problem be outside the scope of an emergency breakdown, don’t worry we have a specialist division that will get you back up and running in no time. The Hydraulic hose that has burst is 25 meters long, can you still help me? Yes we can, please make sure you notify the controller about the specifics of the hose failure when you call the breakdown in. It is 03:00 in the morning – can I still call in a breakdown? We were really pleased with the engineer who attended our last breakdown; can we ask for the same engineer to attend this emergency? Yes you can. However, we cannot guarantee the engineer will be available to attend this breakdown within our targeted 1 hour ETA as he may already be on another job. What areas are you able to attend emergency breakdowns in? My breakdown is outside the M25 and surrounding areas – can you still assist? Yes we can. We have established a trusted and reliable network of sub-contractors across the UK; we will keep your machinery moving from the tip of Thurso – Scotland to the lower south- west of Penzance. Give us a call now on 0800 707 6556 Top We’re here to help, so if you can’t find the information you’re looking for here then please get in touch and someone will get back to you as soon as possible.